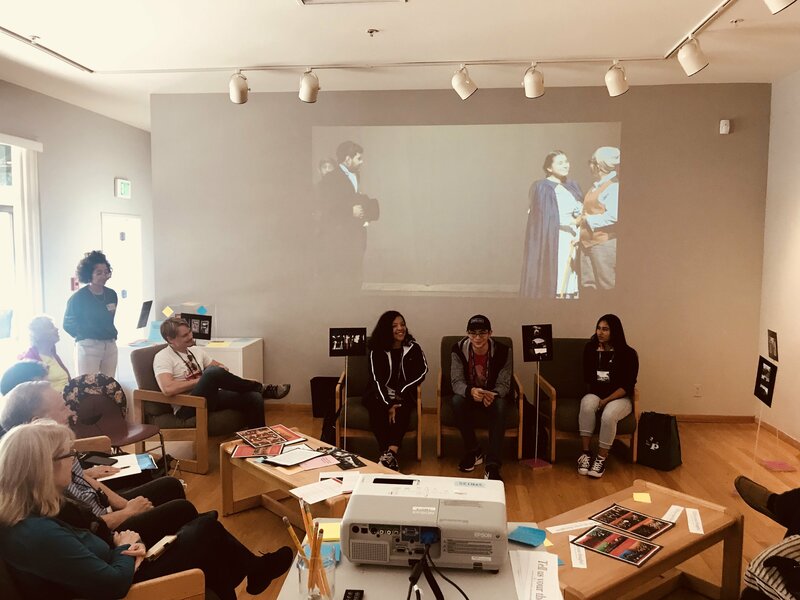 From South LA to Santa Cruz via Little Dorrit: USC NAI-Foshay students and teachers present public humanities project based on Charles Dickens novel at the Dickens Universe, one of the largest academic conferences on Victorian fiction in the world. 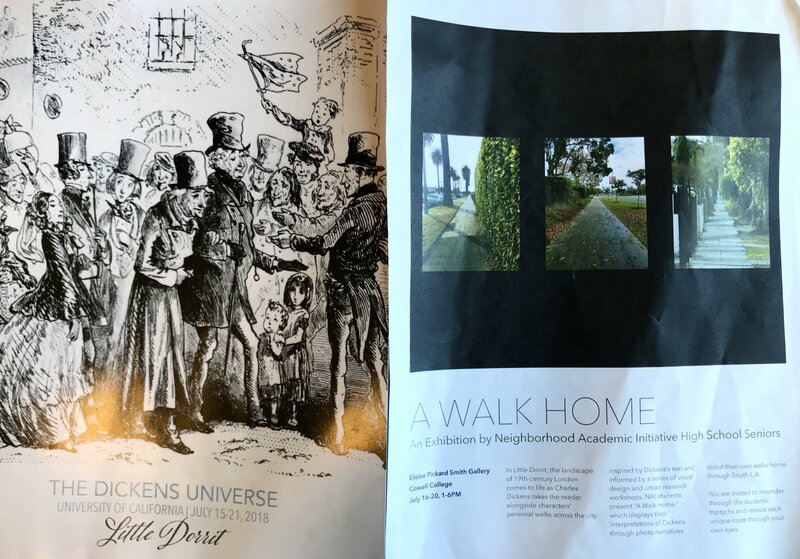 Pictured above is the Dickens Universe program with exhibition flyer featuring a student triptych by Dahlia Ballasteros, USC NAI and Foshay alumni. The Youngest Dickensian Panel: (L-R) USC NAI-Foshay alumni and essay contest winners, Angie Veliz and Andrew Oropeza, with Kimberly Mejia, former winner and alum, speaking about how they used their urban context to adapt Little Dorrit using a blend of visual performing arts and urban humanities methods. Student Work on View: This third installation of "A Walk Home" exhibition included over forty photographic triptychs of the South LA neighborhood combined with poetic captions penned by students, all inspired by their reading of the novel. Also on view were stills and film from the students' performance and festival that culminated their study of Dickens. For more about our study, please view our slideshow or visit our website. A Humanities Pipeline: Student panelists, all first generation readers of Victorian fiction (and college students), address a gathering of professors, graduate students and Dickens Project scholars at the Eloise Pickard Smith gallery. Students greet newcomers with an explanation about the thinking and process behind the exhibition during orientation at UC Santa Cruz. Victorian studies professors, graduate students and Dickens readers listen in as Andrew Oropeza explains their take on the novel. 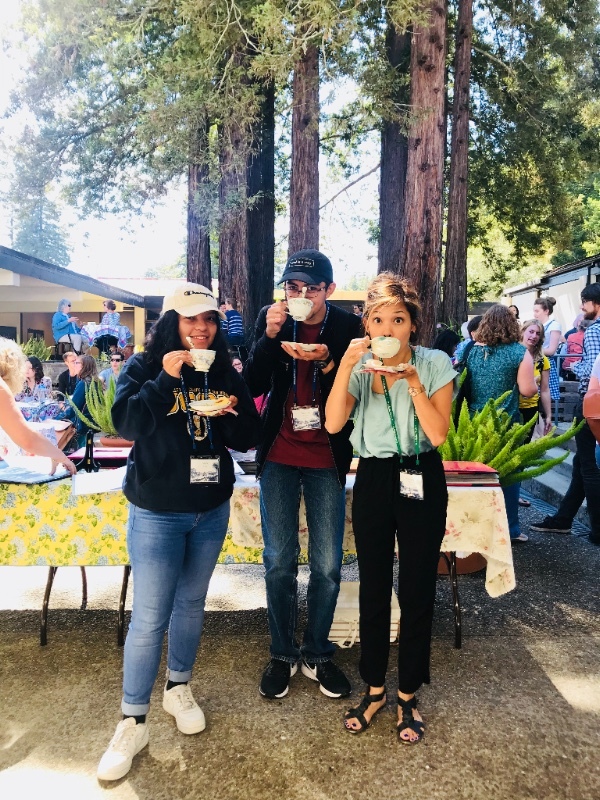 Tea Under the Redwoods: Students and AP English Literature teacher, Jacqueline Barrios, take their tea with handmade desserts during a daily afternoon ritual at the Dickens Universe, courtesy of the Friends of the Dickens Project. Arriving at the end of the journey, it is apparent that no street is untouched by the weathering of time, but rather graced with emptiness; next to bricks; next to metal hinges; next to the gates that connected them all; the emptiness is teeming with traces of life. 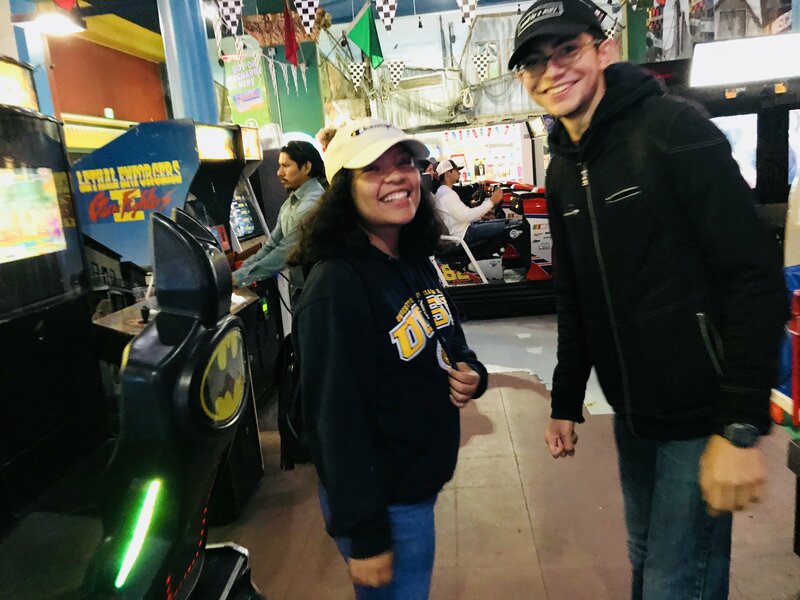 Little Dorrit's Party Continues at the Arcade: The students take their competitive spirit to the arcades, at the historic Santa Cruz boardwalk. Fellow Travelers: Concluding the week, the team gathers to celebrate. (L-R) USC NAI teaching staff Jacqueline Barrios, Paul David Story & Antoinette Pippin; Dickens Project director of outreach, Dr. Jon Varese; USC NAI-Foshay alumni Angie Veliz and USC junior and teaching assistant, Kimberly Mejia. “Words connect worlds,” said Andrew Oropeza, summing up a week-long immersion inside the world of Charles Dickens’ Victorian novel, Little Dorrit, while ensconced in woodsy UC Santa Cruz and hundreds of miles away from his South LA campus and neighborhood. Andrew, along with Angie Veliz, are Foshay graduates and NAI alumni who wrote winning essays leading to their representing their peers this summer at the Dickens Universe, the world’s largest conference on Charles Dickens and his times. The winners brought up their entire class’s projects from their exhibition, “A Walk Home,” now in its third installation. 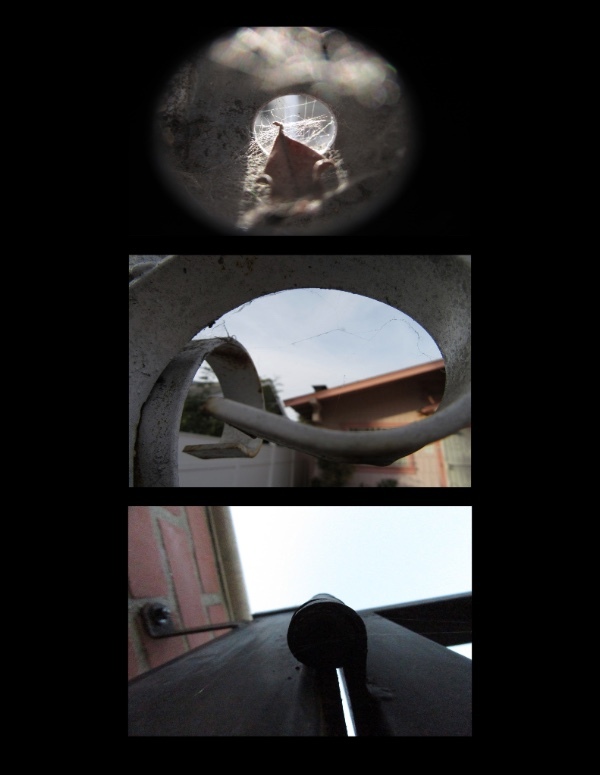 The exhibit presented photo-narratives about students’ own walks home through South LA. Inspired by passages from the novel and informed by a series of visual design and urban research workshops, “A Walk Home” invited Dickens Universe attendees to meander through triptychs, retracing each unique route through their eyes. Teacher and director, Jacqueline Barrios accompanied the students along with Paul David Story, the co-director of the USC NAI Theater Workshop, assistant director Kimberly Mejia (also NAI alumni and former Dickens essay contest winner) and Antoinette Pippin, 6th grade NAI teacher. Andrew says of his project, “I loved the way Amy Dorrit witnessed the streets coming alive even before the sun had risen. So, it was important for my photographs to show how life can be found in unexpected places at unexpected times.” The students read poetic captions about their photographs, trying their hand at being a “young 21st century Dickens.” They also explained the visual language of their photographs while fielding questions from curious professors, graduate students and Dickens readers about how they connected to the novel. A Walk Home” exhibition is the first project to specifically link the novel to students’ local space, combining urban humanities methods with traditional literary study and visual performing arts adaptation. “Our triptychs are able to connect the centuries because they are about how to perceive location and time,” said Andrew. In addition to photographs, the exhibition’s first installation in January at their home campus hosted a thick-mapping activity where students’ friends and families traced their walks home, producing a collaborative LA version of the London imagined by Dickens in the novel, a city that comes alive through the interconnected paths of otherwise disconnected people. The exhibition was re-installed at UCLA in May at Salon 01, a symposium put on by the alumni of the Urban Humanities Initiative (UHI), a humanities and urban design research program based in UCLA. The students also introduced the Dickens Universe audience to their performance and festival, part of the umbrella public humanities event inspired by Little Dorrit which the students mounted and presented this January, of which the exhibition is a part. These interlocking student projects culminated DorritLab, an interdisciplinary study of the novel conducted in NAI students’ AP English class taught by Barrios, who is also a PhD student in English at UCLA. Students invited their peers, friends and family to dive into the novel through theater, dance, music and interactive activities. Clips from the production as well as ephemera from the show were also on display, along with a slideshow of stills from previous “LitLabs” projects on Dickens Universe novels since the beginning of the partnership between the Dickens Project and USC NAI-Foshay in 2012. Directed by Jacqueline Barrios, LitLabs is a public humanities initiative working to design interdisciplinary curriculum interested in imagining what it means to be a 21st century South LA urban teen reader of a 19th century novel. Supported in part by the Dickens Project, LitLabs is an immersive learning experience with seniors in the USC NAI program, where students unpack the world of the novel through a wide range of approaches from the fields of visual and performing arts, architecture and urban research. Partners of note this year included UCLA’s UHI and Contra Tiempo, an LA-based urban-Latin dance company. While studying characters, themes and 19th century urban space in the novel, the students attended intensives, hosted a marathon and used what they learned to orchestrate a community-wide event to showcase their work. An important vision of the initiative is to materialize a pipeline for underrepresented students to engage in humanities study at the university level and beyond. 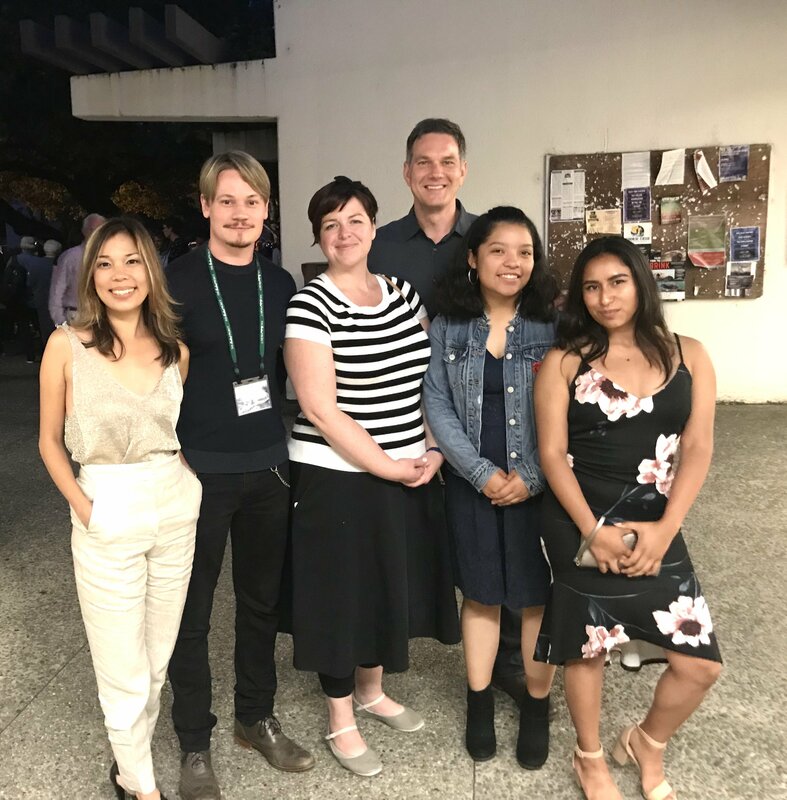 Andrew and Angie, like previous winners of the essay contest before them, attended seminars and lectures while interacting with humanities scholars at all levels of study, from first-timers like themselves to Victorianists working and teaching at universities throughout the world. A take away for the conference’s newest South LA attendee? “I keep thinking about what we learned about the Circumlocution Office. It’s Dickens’ demonstration of the ways those with political and social power do nothing to help the people they serve. I saw how the system then is still reflected in the system we have today,” said Andrew, who will begin his freshman year at USC this fall, studying music and, not coincidentally, narrative studies.